Rio Secco recently completed a 2 Million Dollar renovation project that included brand new greens surfaces throughout the course, greenside bunkers, a brand new all-grass range, new putting green, new practice bunker, updated chipping green and new forward tees on five select holes! 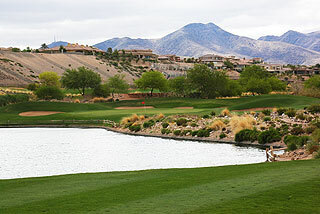 Rio Secco has consistently been ranked a top course in Nevada by most national golf publications. 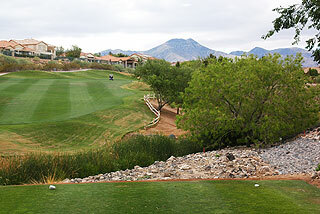 PGA Tour player Daniel Summerhays holds the course record (63) and a claim to fame is that this facility hosts the Butch Harmon School of Golf. One will notice quickly that this will not be just another day on the links. Spectacular vistas of the mountainous desert and valley below, including views of the Strip in the distance, combine with a gorgeous clubhouse and outstanding amenities designed to cater to the seasoned golfer. Everything is first class, from the exceptional layout and conditioning to the plush golf carts, equipped with the most comfortably padded seats we have ever experienced. Having a bad day - just sit there and enjoy the views, it may get better. 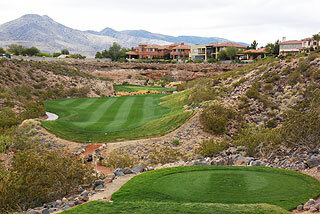 Designed by Rees Jones, the course sits in the rolling foothills of the Black Mountains, along 240 acres of majestic scenery in Henderson, just 15 minutes outside of Las Vegas. Guests will find a full complimentary practice facility with spacious range, short game area and a challenging putting green that allows you an opportunity to experience some of the undulations and slopes you will encounter on the course. The clubhouse features a dining area and lounge (great food drinks) that serves breakfast and lunch items, with wonderful views of the surrounding area available on a comfortable outdoor patio. The pro shop has a great selection of apparel and accessories, and also includes locker areas for men and women, and outstanding banquet facilities. Each golf cart at Rio Secco is equipped with two coolers filled with bottled waters. On course golfers will find sprinkler heads measured to the center of the green, 100/150/200 yardage plates in the center of the fairway, and rotating pin placements.. Three sets of men's tees measure 6921 (138 slope), 6548 (134 slope) and 6081 (122 slope). Ladies red tees measuyre 5258 with a slope of 127. There is not much water in play on this layout, but elevation changes and wind make club selection a bit tricky. The key to scoring well here is in reading the greens, which provide tricky slopes and not so subtle undulations. Keep in mind that most putts will break towards the strip. The putting surfaces on our visit were amongst the best we have played - extremely well conditioned, quick and fun to play. Many are situated between rock outcroppings, or laid in front of grass or desert mountain walls. This is one beautiful golf course! The opening hole is an easy one - a short par four with the putting surface sloped back to front. Golfers learn that in most instances at Rio Secco, approaches are best left below the flag. The long par four first hole doglegs right from an elevated tee area. A shot placed right of the last fairway bunker will cut some distance on this # 1 handicap. The beautiful par 3 second plays over a desert ravine with plenty of room short and is followed by a risk/reward par four. Long hitters will be tempted to go for the green, though treacherous bunkers and a severe slope that fronts the putting surface make a great case for laying up. A tee shot past the 150 will leave an even lie for the extremely uphill approach. Four doglegs left with a 215 yard carry over the left fairway traps, from the white tees. Those with this distance can cut the hole significantly; others should play towards the 150. The par 3 5th is another beautiful hole, featuring a carry over another ravine, with room short for those who wish to approach cautiously. The sixth is also gorgeous to look at, but tough to score on. An extremely accurate tee shot is necessary here, to a narrow fairway from an elevated tee. The green is surrounded by 20 foot rock cliffs, with a beautiful residential building sitting atop. A wide open fairway will greet golfers on the seventh tee. A huge green-side bunker short left is the only obstacle to a good score here. The ninth hole is very long (601 from the tips) but is playable. Number 10 offers rolling fairway that bends slightly left. 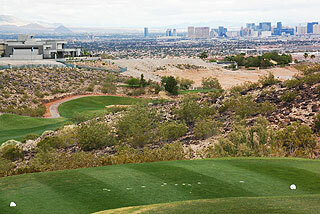 Great views of the Las Vegas Strip are available from the tees and fairway on 11, which plays long and straight. At 489 (blacks), 460 (blues) and 436 (whites) yards long, this hole demands length and is difficult to reach in regulation. Number 12 presents a tee shot over a ravine with ample bail out room. Beginning and high handicapped golfers will appreciate this feature at Rio Secco - bail out areas on many of the holes with forced carries. Beautiful mountains behind the upscale homes provide a postcard backdrop on the par four 13th - which is a very score-able hole. A tight fairway with mounding right and a desert ravine all along the left make the tee shot on 14 one of the most demanding of the layout. The prevailing wind will make this 595 (tips) par five play long. The 15th is also a tough driving hole, though those with prior experience here have an advantage. 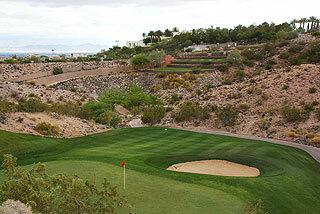 The best placed tee shot will clear the 150 stake, that is barely visible behind the middle right fairway traps. 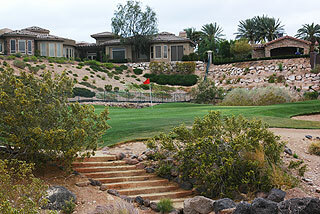 Land on the fairway, and a low score is possible here. The pretty par 3 sixteenth demands a carry over a pond with room for error short right. This group of holes (3-7) is a score-able stretch, and prepares golfers for a resounding finish. 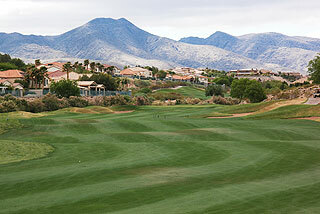 The 17th is extremely tight off the tee, with an approach over a desert area about 40 yards from the green. This long par five will be a 3 shot hole for most golfers, with par being a very good score. The elevated putting complex, with a desert wall background is quite stunning. 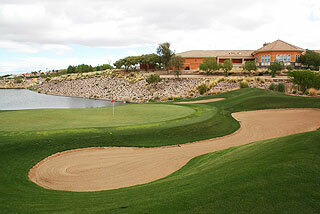 The finishing hole is a challenging par four, measuring 472 yards from the championship tees. A short desert carry leads to a wide open fairway, with water left of the green creating a demanding approach to a well bunkered green.